Posted December 4, 2018 & filed under Professional Author Tips, Writing Craft Tips. So many good books to celebrate this year! I’ve been following the “best of” lists, the successes of friends, the books that are making a difference in kids’ lives. 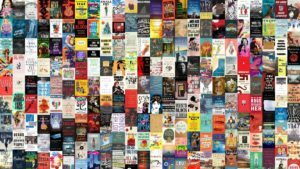 I decided to make my own “best of” list, but not of books (for those, please see the CBC lists, and NPR’s list, among others. What follows is a “best of” list of some of what I’ve learned about living the writer’s life. I hope it helps you during the season of what can be, for some, both ups and downs. Write a little every day. Even if it’s just a sentence. Even if it’s just an idea. Some ideas are better than others. Choose to write the idea that speaks to your heart. A writing career is non-competitive. Another’s success does not mean your failure; there’s always room for another book on the shelf. Successful writing careers are like icebergs – there’s a lot more craft-work going on under the surface. Craft books are inspiring, so find a new one and absorb its messages if you are in a writing funk. Read, read, read. Especially if you are in a writing funk. Your physical health is important to your writing. Taking a walk is a great way to get the brain working. Eat and drink in moderation, exercise every day. Join a writing organization like SCBWI or RWA or MWA. Build community. Build fellowship. They provide invaluable information, too. On the other hand, rejection should always be a time of reflection – is the work as strong as it could be? But don’t keep revising the same piece over and over. At some point, move on. Your skills will only grow when you stretch. Try writing something outside your comfort zone at least once a month. Poetry, a short story, a picture book (if you’re a novelist), a novel (if you’re a picture book writer). Nothing you write is ever a waste. There’s a lot of waiting in publishing: write something new while you wait on something old. Cultivate beta readers you trust. Listen carefully to what they say. Give back. Mentor new writers, mentor kids, be a great beta reader yourself. The writing community (especially for children) is tiny. Be nice. Be thoughtful. Be honest. Take the long view. That editor or agent who rejected you yesterday might just be the editor or agent who accepts you tomorrow. Don’t burn bridges. Never read Goodreads’ reviews. Period. Travel, if you can. Seeing the world through the eyes of those entirely different from you will enrich your writing. The world needs your words, your ideas, your thoughts. No one else can express ideas the way that you can – you are unique. Write from your heart and you’ll succeed. I love this, Janet! Can’t wait to share. This is a great list, Janet! I’m glad to have it to pass on to others. Thanks so much, Linda!!! Happiest of holidays!